Cookies are absolutely amazing, but usually they are the worst thing to eat when you're trying to be healthy. They're mostly filled with sugar, saturated fats, and preservatives if you don't get fresh ones. These Greek yogurt lemon raspberry jam cookies are fabulously frugal and healthier to boot with fat and sugar significantly reduced. Even protein, fiber, and heart healthy fats are higher than normal thanks to the ingredient choices. Enjoy these sweet treats! Cream the granulated stevia extract and egg together. Slowly add in your almond meal, baking powder, ground flaxseed, and Chia seeds. Then mix with Greek yogurt, honey, and lemon juice. Chill in the fridge for 30 minutes. When the batter is ready, roll into balls and drop onto baking sheet. Cook for 8 minutes and then take the sheet out. Stick your thumb into the middle of the cookie, fill with raspberry preserve and then cook for an additional 2-4 minutes. Love these delicious and nutritious sweet treats for dessert or with your breakfast! 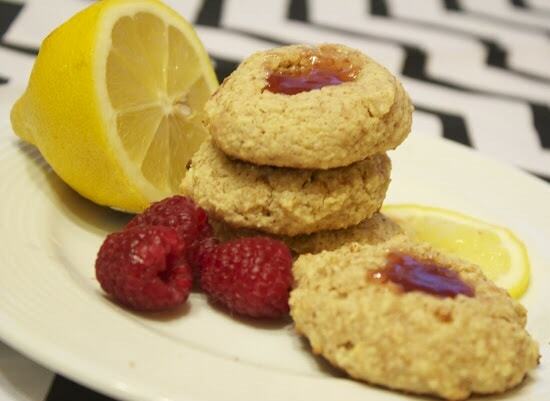 I hope you enjoyed this free healthy frugal recipe for Greek yogurt lemon raspberry jam cookies on a frugal budget.